The ice bikes are built by General Welding & Fabricating, Inc., in Elma, N.Y.
BUFFALO — If a tree can grow in Brooklyn, it stands to reason something unique also could sprout here in the frozen western hinterland of the Empire State. That’s not precisely what Lisa Florczak had in mind when she came up with her ice bikes idea, but she definitely was looking for something different as she set out on her Google search. “I just typed in, ‘Things to do on the ice’,’’ recalled Florczak. And there it was, right there in downtown . . . Beijing. That’s right, from her home in the Buffalo ’burbs, Florczak discovered that ice bikes were already a thing in the People’s Republic of China. Now they’re a thing here, a fast-emerging thing, with folks eagerly doling out $10 per half-hour to tool around the magnificent outdoor Canalside rink that had its grand opening downtown just days before Christmas. 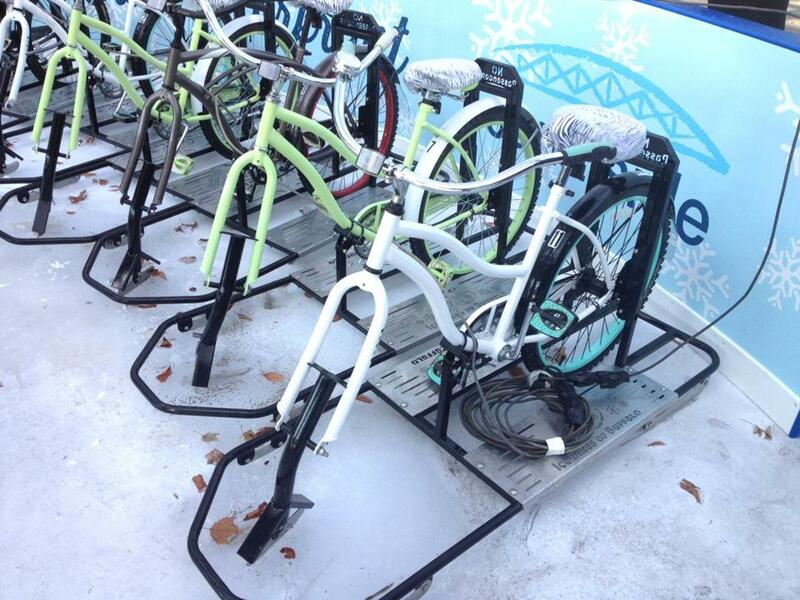 For the uninitiated (raise your hand, 300 million-plus Americans), ice bikes are precisely what they sound like. They are bicycles engineered and built solely for use on ice, transforming the art and intricacies of ice skating into what amounts to a leisurely pedal through the park. Provided, of course, the park grounds resemble the floor of the Garden when the Bruins are in the house. A skate blade replaces a front wheel on an ice bike. The bikes, built by General Welding & Fabricating, Inc., in Elma, N.Y., have two pedals, a rear tire, and handlebars. Instead of a conventional front tire and axle, the rider uses the handlebars to steer what amounts to a skate blade attached to an elongated steering column. 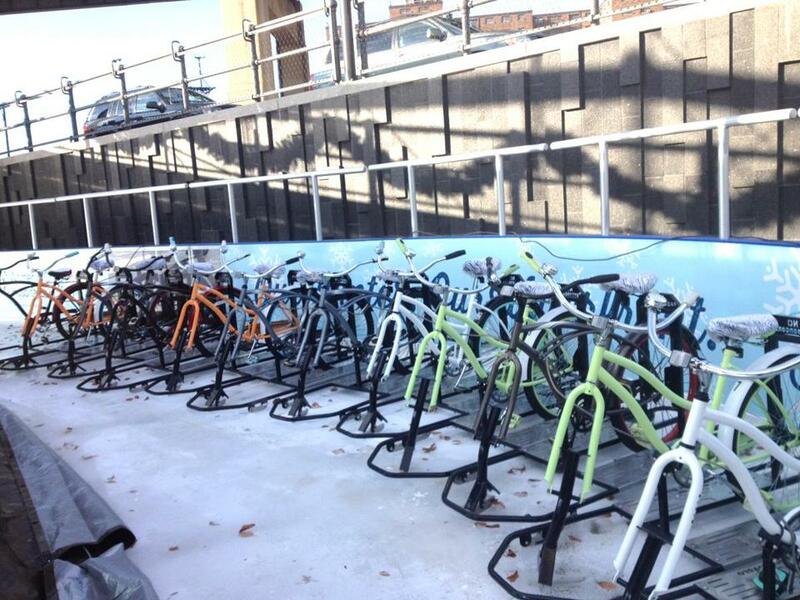 Once Florczak and her husband Peter were convinced the bikes were built with significant drag, thus preventing the rink from becoming a new-age “Demolition Derby,’’ they placed the first dozen models into service at Canalside. People here do get very emotional about their city, which for decades has been the brunt of jokes, typical of many US cities, once vital and vibrant, that decayed as heavy manufacturing industries started to fade in the 1960s. Too many Bostonians conveniently have forgotten, or simply don’t know, that “The Hub of the Universe’’ fell into a steep post-World War II decline when thousands upon thousands of residents hit the road for the ’burbs. The redevelopment of Quincy Market and Faneuil Hall at the start of the ’70s helped spark the comeback. The Ice at Canalside, with its expansive outdoor skating surfaces, is part of what Buffalo city fathers and entrepreneurs hope will be a key component of a Boston-like turnaround. The most ardent Buffalo-basher would be hard pressed to find fault in the outdoor skating mecca, which accommodates skaters, ice bikers, and all manner of on-ice recreation, including a large area marked off for curling (with an on-site instructor for stone-and-broom newbies). 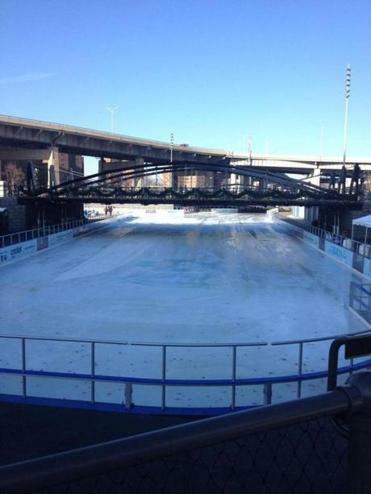 The Ice at Canalside is 33,000 square feet. The project, backed by $20 million in state funds, is made up of some 33,000 square feet of skating area, including one stretch that is 336 feet long — some 70 percent longer than the standard 200-foot-long NHL rink. The width of that long runway varies, from 64 to 83 feet, and an adjoining sheet, for curling and other activities, measures roughly 100 x 50 feet. In a city known worldwide for its legendary snowfalls, someone figured out that ice could be a tourist attraction, or at least an allure for suburbanites to go back in town. In what some might consider a bit of bad luck for a city that has had more than its share, The Ice at Canalside was forced to close over the Christmas break because, well, winter went on holiday. Like Boston, the temps climbed too high, making it impossible for rink attendants to keep the high-tech refrigeration system cranked high enough to maintain surface temps in the low-20s (Farenheit). The ice surfaces inhabit the very space where the Buffalo Sabres played when they made the Aud their home for decades. The Sabres now play across the street from Canalside, at the First Niagara Center, which is also where club owner Terry Pegula has poured millions into the glistening Harborcenter project, which includes two more NHL-sized rinks. According to Florczak, her company (visit www.waterbikesofbuffalo.com) is now talking about branching out to other cities. Ottawa, with its famed Rideau Canal, would seem perfect. Ideally, she said, users are encouraged to ride the bikes on groomed surfaces as opposed to, say, frozen ponds or rivers. The company has not yet started to sell ice bikes to the public, but Florczak anticipated that day is coming soon, with a retail price upward of $1,800 a unit. As Bostonians with any memory can attest, it is a long road back. The journey has begun here in Buffalo, one skate stride, one push of the pedal at a time. Kevin Paul Dupont’s “On Second Thought” appears on Page 2 of the Sunday Globe Sports section. He can be reached at kevin.dupont@globe.com. Follow him on Twitter @GlobeKPD.